If they can be efficient, look out. But that’s if the details are minded. If Nebraska can execute the offense the way head coach Scott Frost wants, he sees something dangerous brewing. Don’t turn it over, run a new system smoothly against elite defenses, those are a lot of ifs. And Nebraska still has a question mark at the quarterback spot after Friday’s scrimmage. Frost says the “sky’s the limit,” but that quarterback position will ultimately be the deciding factor in whether the offense reaches its potential in Year 1. During the scrimmage, Frost said defensive coordinator Erik Chinander called plays the way he would on Saturday. 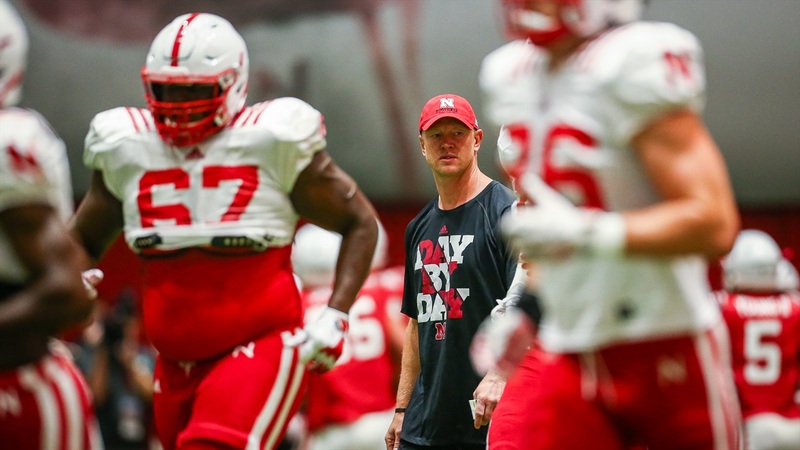 “Some of the pressures and movement and stuff got the best of us on offense,” Frost said. Once Chinander dialed it back a bit and the two sides settled in, Frost said the offense strung some good drives together. Mostly, it has been back-and-forth throughout camp when it comes to who’s beating up on who. Frost sees the improvement. He called this scrimmage, the second of fall camp, better than the first. The team is starting to click at times and at others it's coming up just short. Ultimately, Frost wants consistency. “Execution is starting to get better on both sides,” he said. “I think their understanding of the schemes is getting better, their mastery of the technique is getting better. We’re still making mistakes. Offensively, the last three practices before this one our tempo has been hot, it’s been great. We got out on the field in the scrimmage and that kind of slowed down. The attacking on defense has been really good for three days and we got out in the scrimmage, live, and it wasn’t quite where we want it to be. Asked where the team is now, with two weeks left before the season opener, and where it needs to go in that time, Frost had an optimistic outlook. >> Frost really likes Nebraska’s running back room. He said Friday that the team could play three or four backs at a time this season depending on situation and health. >> One of the deepest spots on the defense is at safety. The Huskers have a returning starter in Aaron Williams and a Central Florida starter from last year’s team in Tre Neal, an experienced Antonio Reed and junior college transfer Deontai Williams all pushing for snaps. Asked how that position would shake out in terms of snap distribution, Frost said they would ideally use two guys for the bulk of snaps, with reserves switching in as needed. As it relates to the secondary as a whole, Frost said that was “one of my big concerns coming into the fall,” but that the group has done a nice job through two weeks. >> The Huskers will begin making depth chart decisions this weekend, Frost said. Prep for Akron will begin the week of the game like normal, but Frost would also like to get a few “bonus days” in the Friday and Saturday before. >> Last year, Nebraska’s defense was 116th in rushing S&P+ and 128th in rushing success rate. Asked how that unit was looking against the run through camp, Frost seemed pleased. “Our defense is pretty good at stopping the run,” he said. “Half of playing defense is getting hats to the ball. Most of the big plays you see in football happen because there’s only one defender there and if you make that guy miss it turns into a big play. >> Husker coaches are putting a major emphasis on special teams participation this season. Running backs coach Ryan Held said a guy’s participation on special teams could be a determining factor in which guys travel for road games and who stays home. Frost said Friday they’ve had guys embrace that. >> There were quite a few former players on hand to watch the Huskers scrimmage Friday. That comes on the heels of two former Blackshirts meeting with the team last week. It’s important to Frost to keep those guys around the program.